Ecumenical councils are church councils that gather worldwide church leaders in one place to debate church maters. The Coptic Orthodox Church recognizes three of them, namely the councils of Nicaea (325 AD), Constantinople (381AD) and Ephesus (431 AD). It participated in a fourth one, Chalcedon (451 AD) but does not recognize it, and it continues to deal with its effects through contemporary inter-churches dialogs in gentleness and love, working toward the Christian Unity. The following is a summary of each of the three councils’ reason for being, the deliberations, the personalities, the heresy, Egypt contribution to the council and the outcome of each one of them. We will follow with the fourth one, but add the contemporary efforts for reconciliation. It is the first ecumenical council of the Christian era, after the Jerusalem Council of the Apostles that was held around 50 AD (see the Acts of the Apostles). The Council was held in 325 AD to deal with the heresy of Arius (Arianism). Arius’ heresy had troubled the church for some time and it was dealt with in the council. The heresy and efforts to solve it: Like many heretics who followed him, Arius did not start as a one, but developed into one later on. He was given the task of preaching in the main church in Alexandria, but he misused the opportunity. He was a priest with an ability to convince the uneducated through his cunning use of words. His preaching denied the divinity of our Lord JESUS CHRIST “the ONLY BEGOTTEN of the FATHER” relegating Him to a deity lesser that the Father. Consequently a fierce spiritual and intellectual battle was waged. Alexandria was the initial battlefield but it eventually covered the Christian world. The first Coptic Pope to be alarmed by the heresy was Saint Peter the first (Seal of Martyrs) the seventeenth pope of Egypt. Pope Peter counseled Arius to shy away from his false teaching through patience, explanation and prayer. Before his martyrdom, Pope ST Peter had a vision in a dream of the Lord Jesus Christ passing him on a road with a torn up robe. When St Peter inquired from the Lord of the reason for the robe’s condition, the Lord answered that “it was Arius who tore it up with his heresy”. Then the Lord proceeded with an warning to St Peter that He requested of St Peter to convey to the church: NEVER ACCEPT ARIUS IN THE CHURCH COMMUNION and tell both Archelaos and Alexandros (the pope’s aids) “they shall follow you in the papacy and to NEVER ACCEPT ARIUS IN THE CHURCH COMMUNION EITHER”. Saint Peter ended up excommunicating Arius for his refusal to shy away from his heresy in spite of the pope patient explanations and gentleness. Saint Alexandros became the nineteenth pope of Alexandria as the Lord Prophesized. He was already forewarned by the Lord Jesus Christ about Arius. Alexandros was elderly and known for his gentleness. Arius sought to be absolved by him from Saint Peter excommunication. Alexandros was gentle as a dove but wise as a serpent. He answered the emissaries: Go and tell Arius that my father Abba Petros (meaning Peter in the Coptic language) counseled me not to have any communion with him. If he repents of his sin against our Savior I will gladly take him back into the church fold. Arius remained defiant and continued to spread his heresy. Saint Alexandros saw the spread of the heresy alarming and convoked a local Coptic council in Alexandria giving full liberty to Arius and his partisans to explain their views and for the Orthodox bishops to do the same. The gentle pope sat patiently hearing the arguments, assenting here, correcting there, but the desired result was not achieved because Arius refused to be convinced. Arius continued spreading his heresy succeeding in convincing two Libyan bishops namely Secundus and Theonas. 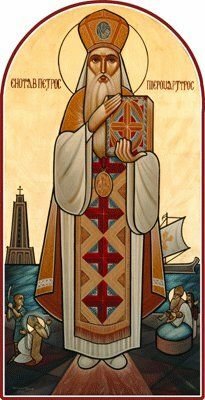 Saint Alexandros convened a second Coptic council in Alexandria convening all Coptic bishops for the Holy See of Saint Mark in the year 321 AD. One hundred bishops assembled and shared in the deliberations. For a second time, the council excommunicated Arius from the church communion and degraded him of his priestly office. Ninety eight of the bishops signed the council verdict except for the two Libyan bishops. Saint Alexandros was most active in refuting the alarmingly fast spreading Arian heresy. Several local councils were convoked in different Egyptian cities for that end. Saint Alexandros also sent letters to all surrounding Christian churches refuting the heresy and warning against its acceptance as church dogma. The conflict spread beyond church circles and spilled into civil society to the point it threatened society’s peace. Emperor Constantine tried to intervene, but lacking the spiritual background he failed to comprehend the consequences of the struggle. The emperor sent his religious advisor Bishop Hosius of Cordova to Alexandria to mediate between Saint Alexandros and Arius armed by a letter from the emperor. An Alexandrian council was convoked for a third time. After attending it, Hosius realizes Arius was a trouble maker. He agreed with Saint Alexandros the only solution is the convocation of an ecumenical council. Constantine agreed to the idea and he convoked the first council of its kind- a council for all Christian churches in existence. The date to start the council was set as June 14, 325 AD. The place chosen by the emperor was Nicaea, a port city on the Black Sea. The Council at Nicaea: The attendees were three hundred and eighteen (318) trained servants of the Most High. Many were confessors who bore in their bodies the scars of their fearless confessions during the pagan’s persecutions of the church. Many had the power of healing the sick and raising the dead. Those gathered came from the Mediterranean Sea basin, Persia and Scythia, so, it was truly universal in nature. The churches representatives from the east were the overwhelming majority, for only six delegates represented Rome. The Egyptian delegation numbered twenty including Pope Alexandros. The most notable member aside from the pope was Athanasius his disciple in his mid to upper twenties in age, bearing the rank of Archdeacon. The council was solemnly inaugurated on June 20, 325 AD without the emperor attendance. The bishops deliberated together. Arius was given full freedom to expose his doctrine freely as well so did his friends. When the Emperor arrived, all gathered in the assigned building, bishops and civil servants assigned to keep the order and the minutes of the meetings. The council officially opened, its first order was the election of a president. The choice fell on Hosius of Cordova, both for his age and sanctity. When the civil servants made a visual roll call they counted three hundred and nineteen (319) which confused them because it exceeded the maximum number of attendees. Upon taking the presence by name calling they counted three hundred and eighteen (318). A great silence befell the gathering, for they understood the Lord our God who said: “If two or three gather in My Name there I shall be in their midst”, actually blessed the gathering with His presence! Next the council held daily sessions and first order of business was to debate the Arian heresy. Arius was often called upon and his doctrine seriously questioned. All attendees took part in the discussions. But increasingly the deliberations became a spiritual and intellectual dual between Arius and Athanasius who trashed the heretic’s arguments by strong interpretations of the Bible. Finally after trashing the subject thoroughly, the council decided the Arian doctrine was a heresy. They decided to sum up the Christian Faith as it had been handed down to them by the Apostolic Fathers in all its elements and make a crystal clear definition. Thus the idea of a creed was born. It was this council of venerable fathers that formulated the Nicene Creed, the first since the apostolic age. A committee of three was chosen to formulate it, namely Pope Alexandros of Alexandria, Bishop Leontius of Caesarea in Cappadocia and Archdeacon Athanasius of Alexandria. The three agreed that the council must affirm the divinity of the Son, as the basis of the Christian Faith of the Universal Church for all time. The appended it to a statement of anathema that would constitute a warning to those who digressed from the established principles of the faith. They wrote the creed from “Truly we believe”… to “We believe in the Holy Spirit”. When the committee presented the creed and the anathemas to the council it was approved and signed by all except three members, Eusebius of Nicomedia, Theognius of Nicaea and Maris of Chalcedon who later recanted and signed the creed but not the anathemas. After tending to theology, the council turned to other matters of concern to all churches. Among them was the date for celebration of Easter, the question of rebaptism, the question of celibacy of the clergy and a number of other questions.